Herefordshire  is a county in the West Midlands region of England, located along the border with Wales. Herefordshire borders the counties of Shropshire to the north, Worcestershire in the east, Gloucestershire to the south east, Monmouthshire in the south west and Powys in the west. 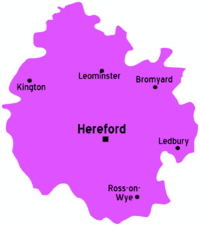 Hereford - cathedral city and county town. Herefordshire is a largely rural county with but a few small towns. Most interest is focused on the cathedral city and county town Hereford. Eastnor Castle  which is a mock tudor castle but with lovely grounds, deer park and plenty to see amongst the lovely Malvern Hills. This page was last edited on 9 June 2011, at 15:26.